Things are not looking good for the Los Angeles Dodgers. The Dodgers entered last night’s game eight games behind San Diego in the NL West and five and a half games behind the Giants. Baseball Prospectus had their playoff odds at a mere 1.9%. The trades the Dodgers made clearly show that they felt that they were in the race. With San Diego and San Francisco both winning last night, yesterday’s game against the Philadelphia Phillies was utterly key for the Dodgers. After a three run rally in the top of the eighth inning that put the Dodgers ahead 9-2, the team had to feel good. With a mere 1% chance to win at this point, the Phillies chipped away in the eighth against Ronald Belisario, Kenley Jansen, and George Sherrill, putting up four runs on four singles as well as a Ben Francisco double. Of course, the rally still meant that the Phillies would need to put up at least three runs in the ninth to make any of it matter, and they would have to do that against Jonathan Broxton– the same Johnathan Broxton who has the lowest FIP (2.35) among qualified relievers over the past three years. Even though Broxton hasn’t had the same kind of shutdown track record as, say,Mariano Rivera, or taking a step down, Joakim Soria, Broxton is clearly an excellent pitcher. With an average pitcher on the mound, the Phillies win expectancy was still tiny, at 4.6%. Against Broxton, that number comes down even farther. When it comes down to it, though, odds between 1 and 20 and 1 in 30 aren’t that terrible, particularly compared to the 1 in 100 odds facing the Phillies entering the eighth. Broxton isn’t exactly a control artist, as his career and season walk rates are both above three. But one wouldn’t exactly predict that Broxton would load the bases via a HBP and two walks. What happened next can hardly be attributed to Broxton, who did his job in inducing a Ben Francisco ground ball to third base. If it wasn’t for Casey Blake letting what should’ve been an easy play go five-hole, the Dodgers could either have gotten an out at home or possibly turned a 5-4-3 double play. Instead of either bases loaded, one out, and a three run lead or the ideal runner on third, two out, and a two run lead. Blake’s error resulted in two runs scoring and runners on first and second. 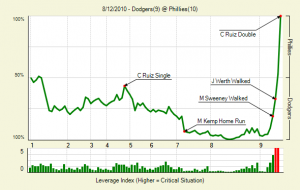 The result of the play was a 47.8% win expectancy for the Dodgers. Were the Dodgers to record the out at home, their win expectancy would’ve been 88.6%; a double play would have left them with a 93.7% win expectancy. These totals are increased somewhat by the presence of Broxton on the mound, but the error was clearly extremely costly for LA, much moreso than Broxton’s loading of the bases, which brought the team’s win expectancy down from 96.4% to 66.9%. Still, the Dodgers were up by a run, and even with runners on and nobody out, the game was essentially a coin flip. Carlos Ruiz tipped the coin in the Phillies favor with a deep double to left field, plating both Francisco and Jayson Werth, and the Phillies won the game. As much as the Dodgers needed to win this game to really have any hope whatsoever of making the playoffs, this game was probably more important for Philadelphia. The victory allowed the Phillies to keep within two games of the Braves in the NL East race and within one of the Giants in the Wild Card, with each team winning last night. We hoped you liked reading Anatomy of a Collapse by Jack Moore! Minor League Stats – Back for Good!